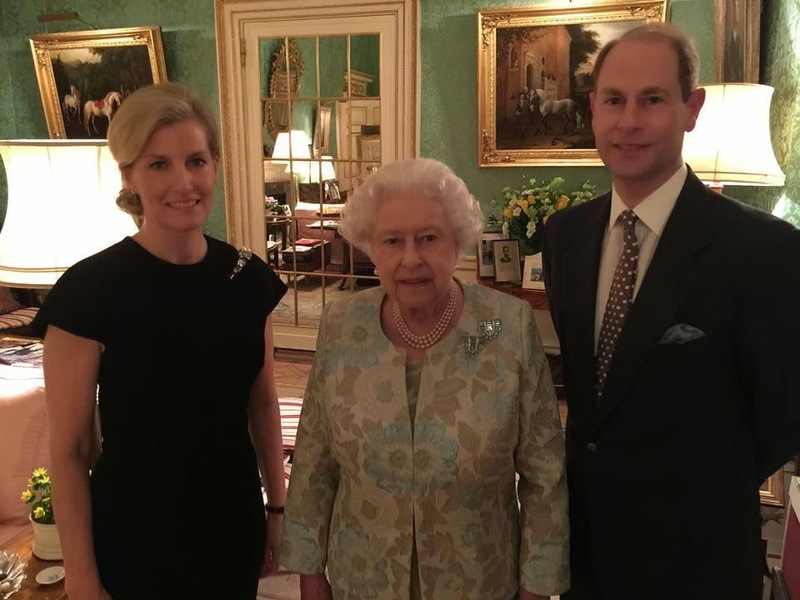 To celebrate the joint 50th birthdays of the Earl and Countess of Wessex (his was last March, hers in January), the Queen held a reception at Buckingham Palace last night for representatives from the couple's many patronages and affiliations. The Duke of York was present too, and he shared the family photo above on his Facebook page. Cute, right? The dress is a simple LBD, ripe for a little jeweled embellishment, and Beckham has very kindly taken care of that by adding a "hand-embroidered wave shaped detail that includes crystals, metallic beads and metal mesh, all sewn onto a silk organza panel and inset into the left shoulder." It wraps over the top of the shoulder, adding a little interest to the back as well. This Victoria Beckham shirt was worn during a meeting with John Mullins last month, and during Victoria and Daniel's San Francisco visit. But I like that Sophie's taking the dive. A lot of VB's stuff has a sleek and modern line to it, not unlike Roland Mouret, which is already a favorite label for certain Windsors. I'm ready for more. For more on this event: See this post at the Countess of Wessex blog, or this gallery with more photos.